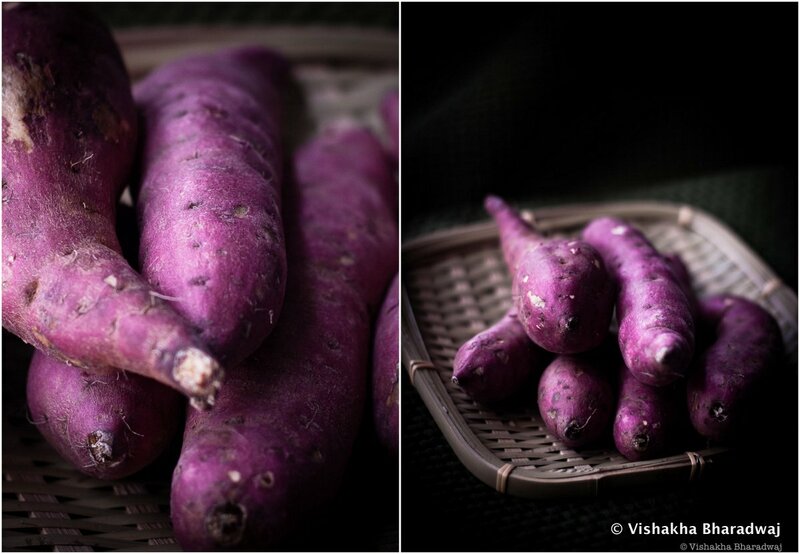 One of my earliest memories of sweet potatoes (Shakarkand, Mishti Aaloo or Aluaa) is from my occasional winter visits to my grandmother’s home in Bihar. Sweet potatoes were found in abundance in the winter months. Bonfires made with wood were common in almost every corner / street. Given the lack of heating equipments then, these bonfires were the perfect social setting for some tea, conversations and food along with the much needed warmth for those extremely chilly winter evenings. Sweet potatoes are common food at these casual, unpretentious gatherings. Someone will usually carve out some of the burning amber coloured wood and cover the sweet potatoes in them to let it slow roast. This can take up to an hour to cook. When cooked, the skin becomes very crisp. It is then peeled and dunked in milk with or without sugar and is absolutely delightful for sweet potato lovers. At other times, sweet potatoes are also cooked in the wood fired mud ovens (choolha) that is common in rural India. The other simpler way to cook them is by boiling them in water, peeling them and then seasoning it with some salt and Teesi as part of a regular meal. If you haven’t grown up with this, you might find the idea strange. R, who spent a number of years in Delhi, finds his peace in roasting and spicing up these tuberous roots. It makes me realize how important it is to try different kinds of food in the early years of life. The food that we eat, especially as children creates memories, forms and shapes how we remember and associate life events and people as we grow up. I must admit though that I never had a strong liking for sweet potatoes (primarily because of its sweetness) until I became a mother. I strongly believe children should be exposed to different kinds of food from an early age. It helps them to have an open mind about food as they grow up. In practice, I take it as an opportunity to nurture my own creativity in the kitchen and make some interesting meals for the family. 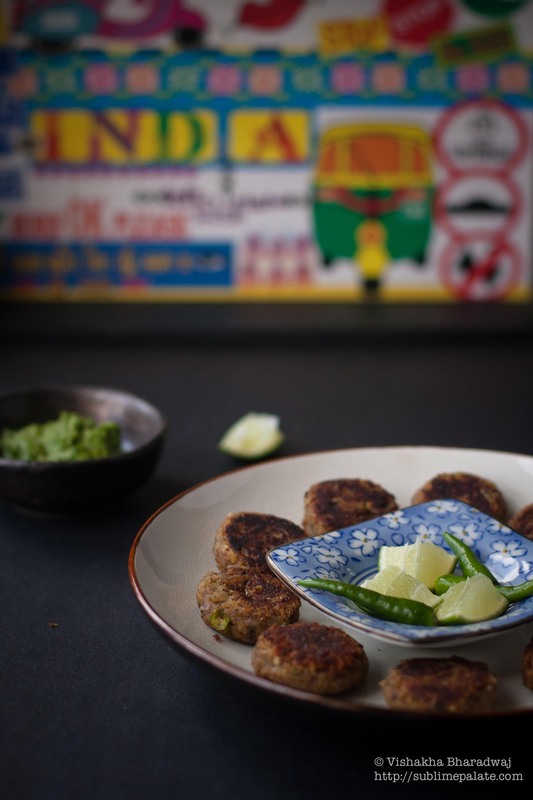 These bite sized cutlets make for a great appetiser to kick start any evening. For this recipe, I boiled the sweet potatoes until cooked yet firm. I wanted to create a flavour combination that would tone down the sweetness of the sweet potatoes while incorporating savoury, tangy and heat in the right intensity. The first time I created these was when I was trying to make something new for little V’s snack box. I also wanted to make something that was bite size, just the right size so that he can use his fingers without making it too messy. Ghee to pan fry the mini cutlets (replace with your regular cooking oil if you prefer): You will need to spread a tsp (or less) of ghee in the skillet. As you cook the mini cutlets, you can use an oil brush or the back of a spoon to touch the surface of the cutlets with ghee/oil. When pan frying the next batch, use a little less ghee, just enough to have some oil lining the skillet. Wash sweet potatoes thoroughly. Slice each sweet potato (skin on) into 2 or 3 big chunks. I used a pressure cooker to boil until steam forms (one whistle). Remove from heat and let it cool down until all the steam is released. Meanwhile, prepare the other ingredients. Shock the boiled sweet potatoes in ice cold water. Peel the skin. Grate these into a large enough bowl. Add all the remaining ingredients listed above. Using your fingers, mix all the ingredients together making sure the spices (masalas) are uniformly mixed. It doesn’t matter if the sweet potato loses the grated texture. Sweet potatoes have been cooked but are still firm and will retain their texture when we shape them into mini-cutlets. 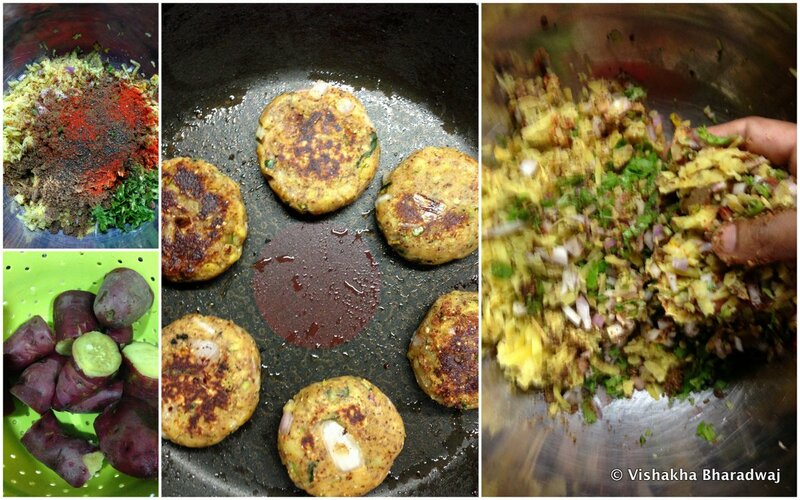 The important thing is to mix this well to ensure every cutlet has the flavours uniformly spread across. Taste and adjust the salt, spice and tangy taste according to your liking. The best way to do this is to pan fry one mini-cutlet first and taste it. I believe the taste alters with the cooking process therefore this step is highly recommended. 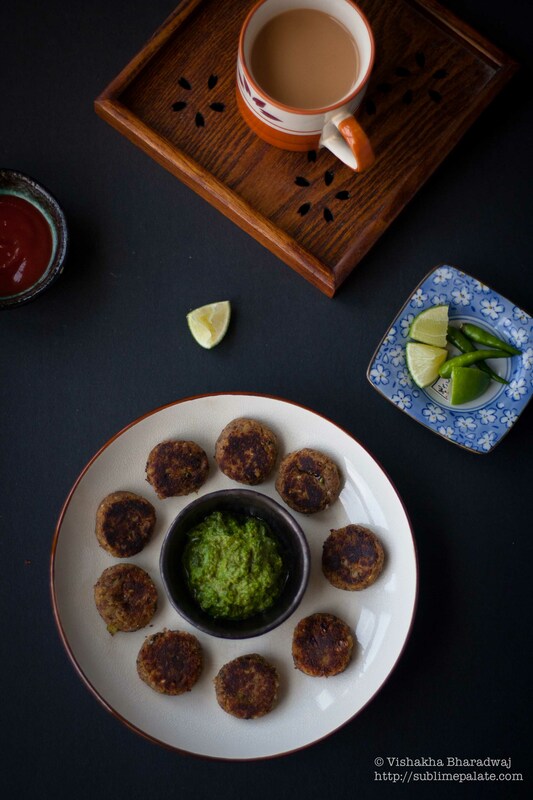 Shape the mixture into bite size cutlets – about an inch to 1.5 inches in diameter. In a skillet, heat about a tsp of ghee (Just enough ghee to wet the skillet) Place the mini-cutlets in the skillet, and cook on low heat until crispy on the outside. As I do not use much ghee in the skillet initially, I like to brush the cutlets with a little ghee on the outside during the cooking process. This helps to give a nice golden color. 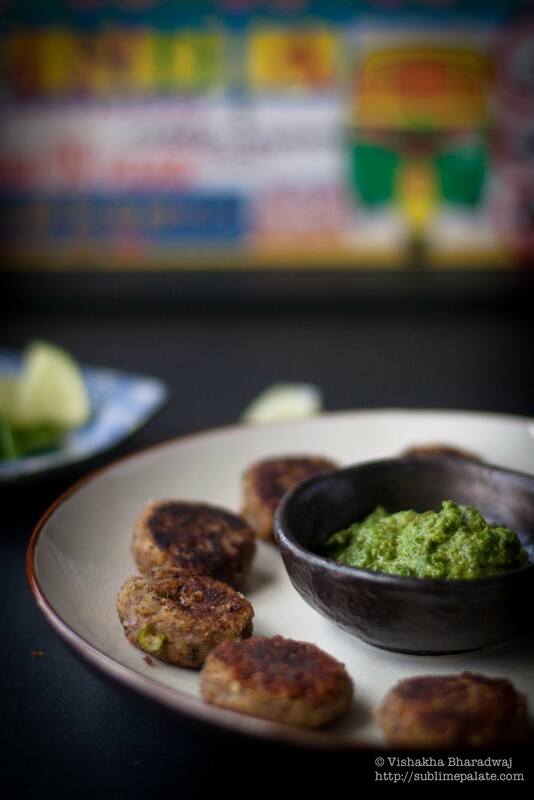 Serve with coriander chutney or a coriander-mint chutney (click here for recipe) or chilli sauce. 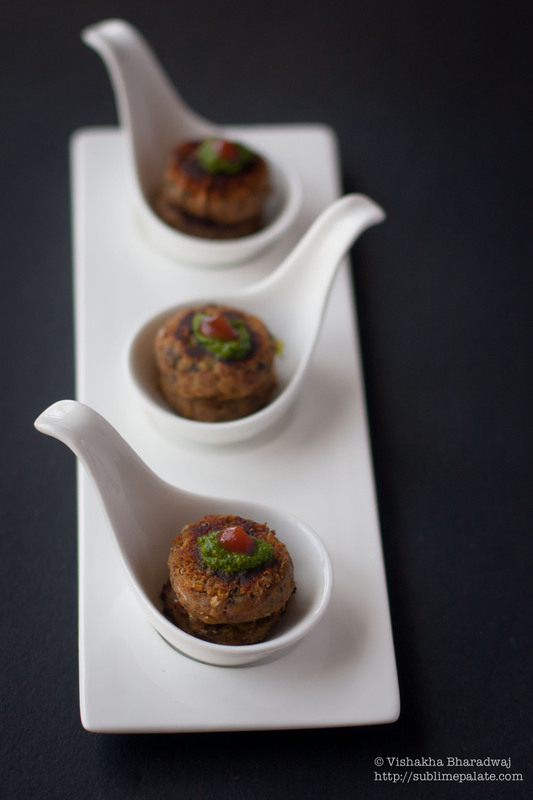 The green chillies are an absolute must in this, if serving for adults. Adjust to your tolerance. I skipped it when I made it for V.
I added Teesi which made it healthier obviously. If you do not want to make Teesi, you can replace it with a tsp of roasted coriander powder and 1/8 tsp of chilli powder instead. The flavour will be different but good, nevertheless. I used Vietnamese sweet potatoes to make this, as it is readily available here. The Vietnamese sweet potatoes have less moisture than many other varieties. I found it easy to shape and pan fry. Author Sublime PalatePosted on August 14, 2013 September 2, 2013 Categories Indian, Kids, Main course, Snacks, Starters, VegetarianTags aluaa recipes, bihari food blogs, bihari food recipes, boiled sweet potato recipes, cooking, cooking sweet potatoes, creative kitchen recipes, dinner, eat, experiment with sweet potatoes, flax seed recipes, food, food bloggers, food from bihar, food memories, food reviews, how to cook sweet potatoes, how to make kids eat sweet potatoes, how to make spicy sweet potato cutlets, how to make sweet potato tikkis, how to make teesi at home, indian food blogs, indian food recipes, indian street food, indian sweet potato recipes, low oil cutlet recipes, mishti aaloo recipes, potato lovers, recipes, recipes from blogs, roast sweet potato recipes, shakarkand recipes, spicy sweet potato tikki recipe, step by step indian cooking recipes from blogs, street food, sweet and spicy sweet potato recipes, sweet potato, sweet potato appetisers, sweet potato cutlet recipe, sweet potato for kids recipes, sweet potato recipes, sweet potato snack recipe, teesi recipes, thanksgiving recipes using sweet potatoes, tuberous roots, Vegetarian, vegetarian appetisers for parties recipe, vegetarian recipes from blogs, vegetarian snack recipes, vietnamese sweet potato recipes, what is teesi, winter evenings, winter food recipes25 Comments on Spicy Sweet-Potato bites!